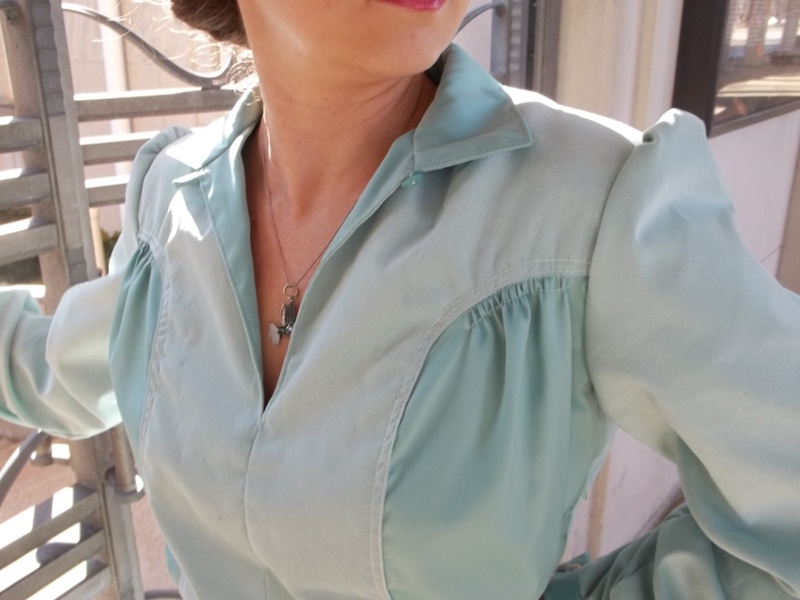 As refreshing as a soothing after dinner treat, this 1940’s outfit is a sweet thrill. 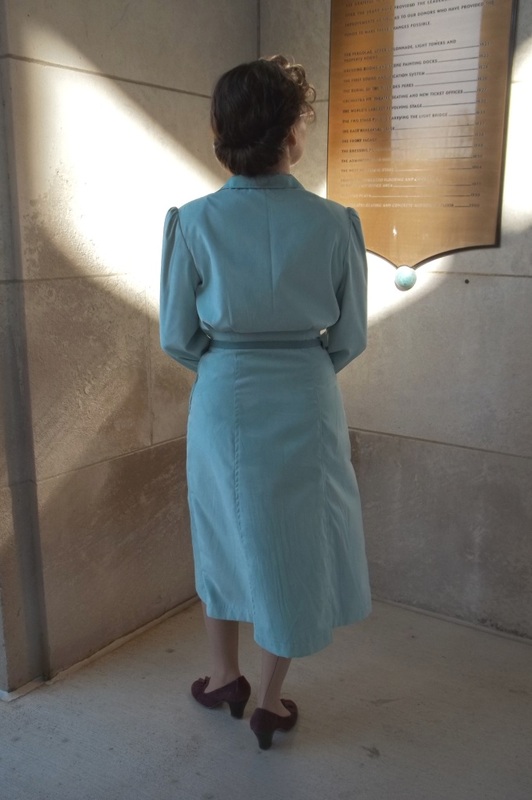 Dating to the early 1940’s, my outfit is as much of a joy to wear as it was to sew and make. It is like a breath of an assurance for balmy weather, on account of the creamy pastel color of my dress, while still being prepared for the cold, because of my long sleeves, my hat, and fabric choices – all wrapped up in one plush, cozy, fashionable package. Not knowing how to pin down a descriptive title for the color of my dress, I coined it “winter mint” one night while talking about my project. I haven’t yet come up with a name for my hat, except for adjectives like “amazing”, “versatile”, “luxurious”, and “handy”. Even my dress’ belt was made to match the specific color and needs of my dress. This is the one outfit so far for which my own two hands have put together, from scratch, an entire outfit of clothes and accessories to wear with one another, contrast/compliment one another, and match in time and era. This is part one of two blog posts. This post will focus on detail about my dress its pattern, and photo shoot location info. Part two will show info on my hat (how it was made and its practicality), how I came up with making a matching belt, and early 40’s hair fashion. 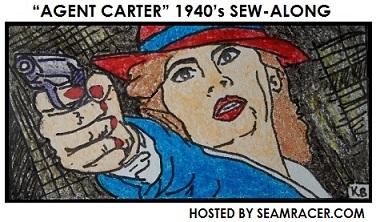 These two posts are part of my “Agent Carter” 1940’s Sew Along. FABRIC: The dress is made using a 100% polyester micro-suede. One side is a lighter, more pastel tone with the fuzzy nap of the suede, the other side is satin finished with a darker tone. NOTIONS: Some thread was on hand already, I needed no interfacing, and the button is vintage from hubby’s Grandmother’s stash. Nothing but a side zipper was needed to buy. TIME TO COMPLETE: On December 29, 2014, just before the new year and in the heart of winter, I finished my suede dress after about 15 to 20 hours. THE INSIDES: The dress’ insides are left raw as the fabric does not fray and is very soft. TOTAL COST: For the dress, I used a Hancock Fabrics gift card (yay for great birthday presents!) to pay for my fabric, but the total cost (which I didn’t pay) came to about $18 for 3 yards. I really can’t peg down this outfit…is it dressy, casual, somewhere in between? Whatever it is, I’ve got nothing like it in my closet before now, and I like having this dress on hand for easy vintage dressing. It seems hard to get those amazing vintage outfits which are practical for cold weather climates at the same time, but I think I found it here. The micro suede is polyester, I know, but what creative person could possible resist playing with the two tones of the right and the wrong sides, as well as LOVE wearing a fabric which feels so good on the skin?! It was quite tricky to figure out the right/wrong side configuration during the pattern layout stage so as to make to dress sections contrast one another. My capability of thinking clearly was put to the test, like when I layout out a pattern on striped or plaid fabric – no half-asleep mindless cutting this time, as sometimes happens for some projects that are super easy. The sleeve cuffs, the skirt pockets, the side bodice sections, and the neck collar were all cut out in the deeper-colored satin side of the fabric, with the rest of the dress (the skirt pieces, sleeves, middle front and back bodice sections) cut to show the fuzzy suede side. With my chosen pattern having such spectacular designing and seaming, I had to show those features off. 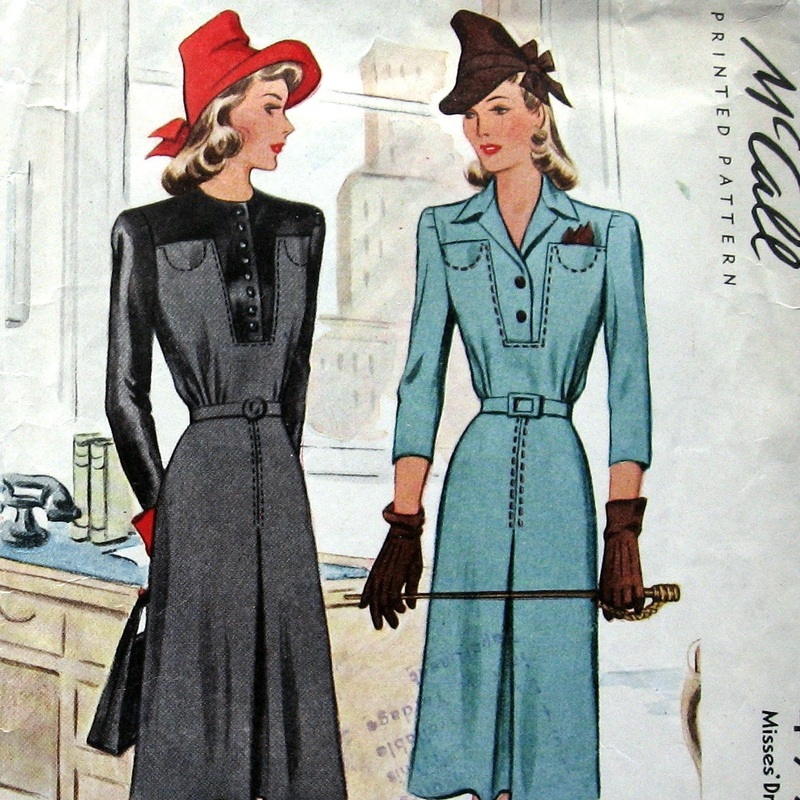 Here’s the cover of another year 1942 McCall pattern (#4998 which I do not own) which shows a dress with very similar design lines with contrasting “satin and matte” sections, too. I did find sizing and fit of this pattern to be not as predictable as all the other 1940’s McCall patterns I have made already. The pattern I had was technically my correct size, with the bust being an inch or so big, but I thought it was close enough. I added a tad more in sizing (1/4 inch) to the side seams of the bottom skirt half of the dress, and the top half of the dress had a small measurement taken out (1/4 inch) to the sides, from the waist up. Even still, the skirt portion still came out snug when it was finished, and I had to take out the ½ inch seams down to 3/8 or ¼ inch instead. Seams that small are pushing the limit of safety, but it’s all I could do to be comfortable with the fit…unless I eat a large meal and fill in any extra space! In contrast, the top half, waist-up portion of the dress turned out roomy and blousy, which is authentic in fit and appearance for the 40’s. Shoulder pads were added into the shoulders to fill in the blousy shirt dress top half, thus keeping it from drooping and defining the silhouette. Such a loose fit for the waist up of my “winter mint” dress would not be minded so much, if only the shoulders didn’t fit me just slightly wonky by drooping lower than normal. Hubby says the droopy shoulders are there, but barely noticeable to anyone else. Isn’t that how it goes? Crafting one’s own garments often makes you your own hardest critic – I know this is the case for me. Sometimes, I mentally build up small points which fall short of my own high standards into a giant discrepancy. Hopefully some of you, my readers who sew, are also perfectionists and can commiserate with me here. In other words, my dress is just fine and perfect in its own right, I just need to quit being hard on myself while wearing it to completely be happy of the fit and way it was made. The pattern never mentioned anything about interfacing in the construction and layout instructions, so I didn’t add any into the suede dress. 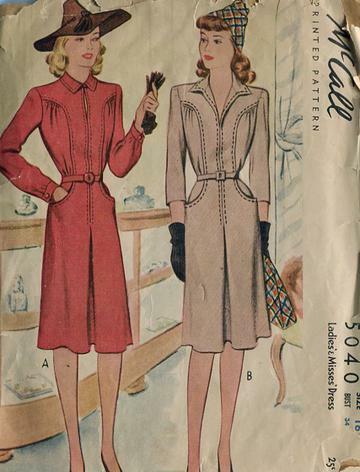 I know old patterns, especially 1940’s and earlier, take it for advantage that a seamstress will know precisely what to do without needing to be told. However, I thought better than to add it anyway, liking to keep up with the soft and easy feel of the suede fabric to lend my dress a similar air. I also made my brown collared 1949 dress the same way as my new suede dress, with no interfacing in the collar and such. It seems appropriate for both of those dresses to be made this way, but it is not my normal practice for most of the collars and cuffs I construct. Like most of the printed 1940’s McCall patterns I have seen, this McCall shirt dress also has its own subtle special features. Bust fullness is provided by four rows of ruched gathers in the side bodice panel. 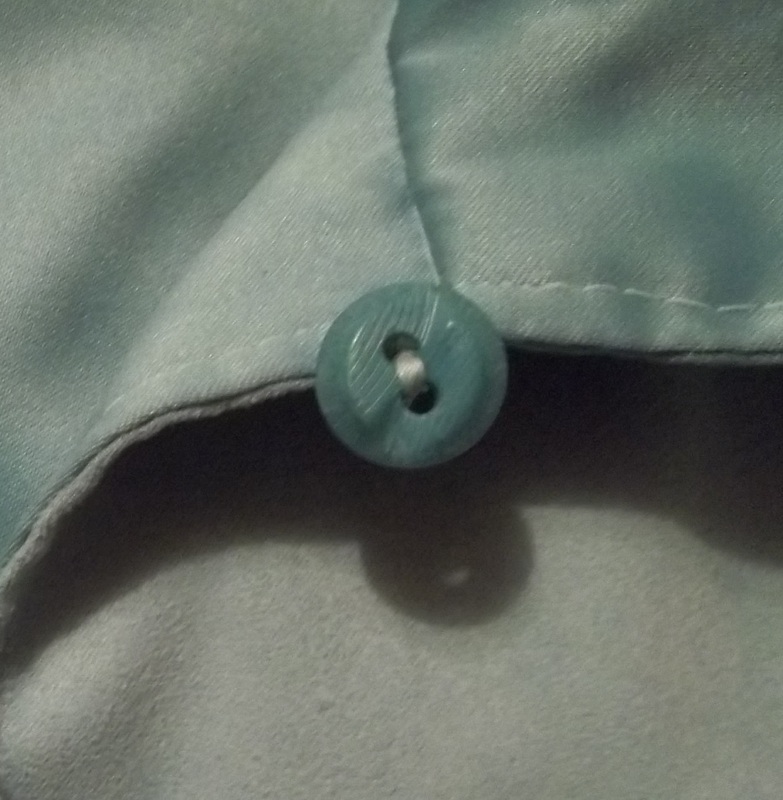 The sleeves end in satin cuffs, made to be closed with cuff links. There are handy set in pockets that are a bit too small to be 100% utility, but still handy. The pockets follow through with the bust side panel section, finishing that front style lines. The skirt front has a center box pleat, while the back skirt has the classic three panel construction of 40’s McCall patterns for great shaping over the posterior. Some of the seams and features to my dress were lost in the plushness of the suede fabric, so I wanted to mention them just in case they couldn’t be seen very well in our pictures. I really do not understand the button and loop up at the top of the neck opening. I followed the pattern, but as it turns out the button and loop closes at the very closely around my neck, which I’m not 100% comfortable with for long periods of time. Oh well! At least I finally had the opportunity to use a single amazing vintage button from my hubby’s Grandmother’s stash. It is a close match with my dress…actually just dark enough to be noticeable. The button sort of reminds me of a yin-yang, but each side has an opposite slant and tiny grooves on the surface. In order to honor warmer weather with my outfit, I wore a pendant of a hummingbird, made from abalone shell and sterling silver. The day of our photo shoot was one of those late winter days that are suddenly balmy, becoming a teaser. No, I have time to wait for the little nectar loving hummingbirds to come, but they’ll come soon enough. Our photo shoot location was at the front promenade to the Municipal Opera Theatre building in our city’ downtown park. Looking up information about it shows that it was built and opened in 1917, but we saw some sort of dedication stone on the front that dated 1939. Either way, this time period book-ended in the main height of the Art deco era (my favorite), so we tried to include some of these details in the background. My favorite part about the Municipal Opera are those doors, with their beautiful clean lines. The doors remind me of my dress – straight lines and a few curved lines, and something that makes me smile! Have you made a garment that reminds of the very opposite season, like my “Winter Mint” dress? Maybe a summer pattern made to work for winter wear, or a winter garment made into summer appropriate colors, for only two examples of dressing for a different season. It’s nice to know the weather outside does not have control over one who can make one’s own fashion! This is also my first total foray into wearing solid, one tone color. 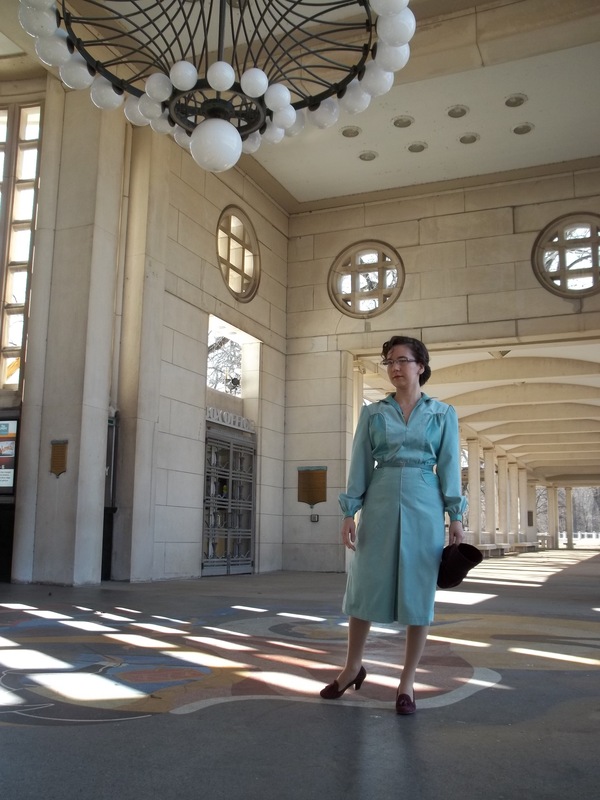 I admire how Peggy in Marvel’s “Agent Carter” knows how to wear primarily solid colors so well, a “talent” (if you call it that) I have a hard time achieving. Look at her amazing brown and pink shirt dress at left. Floral and patterned fabrics are very attractive and appealing, so hard to resist! Do you like patterns or solids, and how do you like to best pair or accessorize solids? 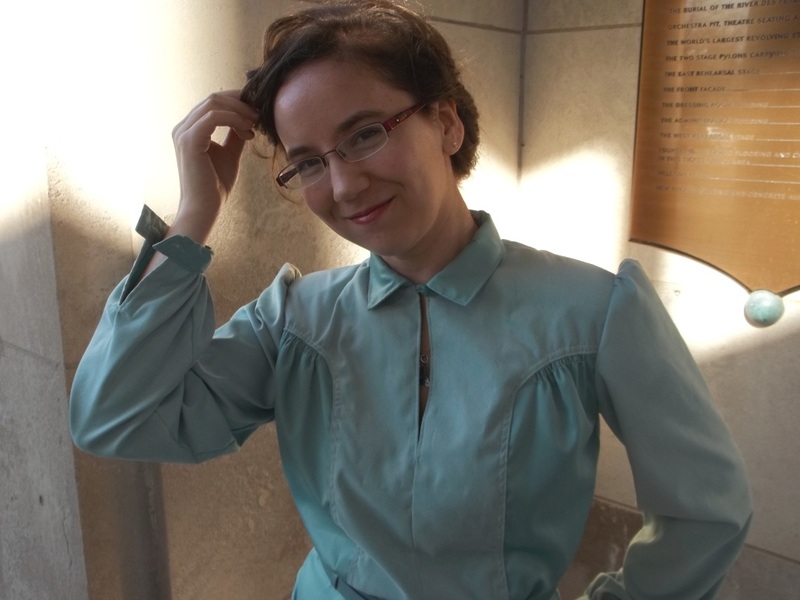 This entry was posted in 1940's and tagged "1940's sew along", "Agent Carter" Sew Along", 1940's, 1942, fitting, green, McCall 5040, Municipal Opera Theatre, retro, sew along 2015, shirt dress, suede, vintage by kellycb. Bookmark the permalink.